Citation Information: J Clin Invest. 2005;115(8):1963-1963. https://doi.org/10.1172/JCI120024. Citation Information: J Clin Invest. 2005;115(8):1964-1965. https://doi.org/10.1172/JCI26200. Yes, even the JCI can weigh in on celebrity gossip, but hopefully without becoming a tabloid. Rather, we want to shine a light on the reckless comments actor Tom Cruise has recently made that psychiatry is a “quack” field and his belief that postpartum depression cannot be treated pharmacologically. We can only hope that his influence as a celebrity does not hold back those in need of psychiatric treatment. Citation Information: J Clin Invest. 2005;115(8):1966-1966. https://doi.org/10.1172/JCI26115. Citation Information: J Clin Invest. 2005;115(8):1967-1968. https://doi.org/10.1172/JCI26055. Citation Information: J Clin Invest. 2005;115(8):1968-1968. https://doi.org/10.1172/JCI26116. Citation Information: J Clin Invest. 2005;115(8):1969-1969. https://doi.org/10.1172/JCI26124. Citation Information: J Clin Invest. 2005;115(8):1970-1971. https://doi.org/10.1172/JCI26030. Citation Information: J Clin Invest. 2005;115(8):1972-1983. https://doi.org/10.1172/JCI26031. The thyroid-stimulating hormone receptor (TSHR) is a G protein–linked, 7–transmembrane domain (7-TMD) receptor that undergoes complex posttranslational processing unique to this glycoprotein receptor family. Due to its complex structure, TSHR appears to have unstable molecular integrity and a propensity toward over- or underactivity on the basis of point genetic mutations or antibody-induced structural changes. Hence, both germline and somatic mutations, commonly located in the transmembrane regions, may induce constitutive activation of the receptor, resulting in congenital hyperthyroidism or the development of actively secreting thyroid nodules. Similarly, mutations leading to structural alterations may induce constitutive inactivation and congenital hypothyroidism. The TSHR is also a primary antigen in autoimmune thyroid disease, and some TSHR antibodies may activate the receptor, while others inhibit its activation or have no influence on signal transduction at all, depending on how they influence the integrity of the structure. Clinical assays for such antibodies have improved significantly and are a useful addition to the investigative armamentarium. Furthermore, the relative instability of the receptor can result in shedding of the TSHR ectodomain, providing a source of antigen and activating the autoimmune response. However, it may also provide decoys for TSHR antibodies, thus influencing their biological action and clinical effects. This review discusses the role of the TSHR in the physiological and pathological stimulation of the thyroid. Citation Information: J Clin Invest. 2005;115(8):1986-1989. https://doi.org/10.1172/JCI26011. Ion channels are pore-forming proteins that provide pathways for the controlled movement of ions into or out of cells. Ionic movement across cell membranes is critical for essential and physiological processes ranging from control of the strength and duration of the heartbeat to the regulation of insulin secretion in pancreatic β cells. Diseases caused by mutations in genes that encode ion channel subunits or regulatory proteins are referred to as channelopathies. As might be expected based on the diverse roles of ion channels, channelopathies range from inherited cardiac arrhythmias, to muscle disorders, to forms of diabetes. This series of reviews examines the roles of ion channels in health and disease. Citation Information: J Clin Invest. 2005;115(8):1990-1999. https://doi.org/10.1172/JCI25505. A variety of inherited human disorders affecting skeletal muscle contraction, heart rhythm, and nervous system function have been traced to mutations in genes encoding voltage-gated sodium channels. Clinical severity among these conditions ranges from mild or even latent disease to life-threatening or incapacitating conditions. The sodium channelopathies were among the first recognized ion channel diseases and continue to attract widespread clinical and scientific interest. An expanding knowledge base has substantially advanced our understanding of structure-function and genotype-phenotype relationships for voltage-gated sodium channels and provided new insights into the pathophysiological basis for common diseases such as cardiac arrhythmias and epilepsy. Citation Information: J Clin Invest. 2005;115(8):2000-2009. https://doi.org/10.1172/JCI25525. Muscle channelopathies are caused by mutations in ion channel genes, by antibodies directed against ion channel proteins, or by changes of cell homeostasis leading to aberrant splicing of ion channel RNA or to disturbances of modification and localization of channel proteins. As ion channels constitute one of the only protein families that allow functional examination on the molecular level, expression studies of putative mutations have become standard in confirming that the mutations cause disease. Functional changes may not necessarily prove disease causality of a putative mutation but could be brought about by a polymorphism instead. These problems are addressed, and a more critical evaluation of the underlying genetic data is proposed. Citation Information: J Clin Invest. 2005;115(8):2010-2017. https://doi.org/10.1172/JCI25466. Since the first mutations of the neuronal sodium channel SCN1A were identified 5 years ago, more than 150 mutations have been described in patients with epilepsy. Many are sporadic mutations and cause loss of function, which demonstrates haploinsufficiency of SCN1A. Mutations resulting in persistent sodium current are also common. Coding variants of SCN2A, SCN8A, and SCN9A have also been identified in patients with seizures, ataxia, and sensitivity to pain, respectively. The rapid pace of discoveries suggests that sodium channel mutations are significant factors in the etiology of neurological disease and may contribute to psychiatric disorders as well. Citation Information: J Clin Invest. 2005;115(8):2018-2024. https://doi.org/10.1172/JCI25537. Long QT syndrome, a rare genetic disorder associated with life-threatening arrhythmias, has provided a wealth of information about fundamental mechanisms underlying human cardiac electrophysiology that has come about because of truly collaborative interactions between clinical and basic scientists. Our understanding of the mechanisms that control the critical plateau and repolarization phases of the human ventricular action potential has been raised to new levels through these studies, which have clarified the manner in which both potassium and sodium channels regulate this critical period of electrical activity. Citation Information: J Clin Invest. 2005;115(8):2025-2032. https://doi.org/10.1172/JCI25539. The QT interval is the electrocardiographic manifestation of ventricular repolarization, is variable under physiologic conditions, and is measurably prolonged by many drugs. Rarely, however, individuals with normal base-line intervals may display exaggerated QT interval prolongation, and the potentially fatal polymorphic ventricular tachycardia torsade de pointes, with drugs or other environmental stressors such as heart block or heart failure. This review summarizes the molecular and cellular mechanisms underlying this acquired or drug-induced form of long QT syndrome, describes approaches to the analysis of a role for DNA variants in the mediation of individual susceptibility, and proposes that these concepts may be generalizable to common acquired arrhythmias. Citation Information: J Clin Invest. 2005;115(8):2033-2038. https://doi.org/10.1172/JCI25664. Here we review the current knowledge about the mutations of the gene encoding the cardiac ryanodine receptor (RyR2) that cause cardiac arrhythmias. Similarities between the mutations identified in the RyR2 gene and those found in the gene RyR1 that cause malignant hyperthermia and central core disease are discussed. In vitro functional characterization of RyR1 and RyR2 mutants is reviewed, with a focus on the contribution that in vitro expression studies have made to our understanding of related human diseases. Citation Information: J Clin Invest. 2005;115(8):2039-2046. https://doi.org/10.1172/JCI25470. The transport of anions across cellular membranes is crucial for various functions, including the control of electrical excitability of muscle and nerve, transport of salt and water across epithelia, and the regulation of cell volume or the acidification and ionic homeostasis of intracellular organelles. Given this broad range of functions, it is perhaps not surprising that mutations in Cl– channels lead to a large spectrum of diseases. These diverse pathologies include the muscle disorder myotonia, cystic fibrosis, renal salt loss in Bartter syndrome, kidney stones, deafness, and the bone disease osteopetrosis. This review will focus on diseases related to transepithelial transport and on disorders involving vesicular Cl– channels. Citation Information: J Clin Invest. 2005;115(8):2047-2058. https://doi.org/10.1172/JCI25495. ATP-sensitive potassium (KATP) channels, so named because they are inhibited by intracellular ATP, play key physiological roles in many tissues. In pancreatic β cells, these channels regulate glucose-dependent insulin secretion and serve as the target for sulfonylurea drugs used to treat type 2 diabetes. This review focuses on insulin secretory disorders, such as congenital hyperinsulinemia and neonatal diabetes, that result from mutations in KATP channel genes. It also considers the extent to which defective regulation of KATP channel activity contributes to the etiology of type 2 diabetes. Akt1 in the cardiovascular system: friend or foe? Citation Information: J Clin Invest. 2005;115(8):2059-2064. https://doi.org/10.1172/JCI25900. Akt is an important signaling molecule that modulates many cellular processes such as cell growth, survival, and metabolism. Akt activation has been proposed as a potential strategy for increasing cardiomyocyte survival following ischemia. In mammalian cells, 3 distinct isoforms of Akt exist, but their precise roles in cardiovascular biology were previously unknown. 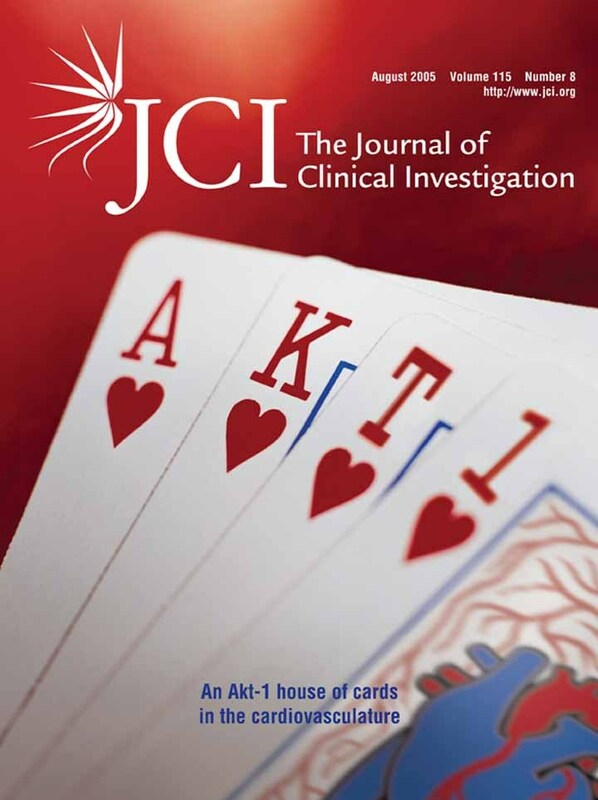 Three separate studies published in this issue of the JCI now provide important new insight into the central role of Akt1 in the regulation of angiogenesis and the maladaptive or deleterious consequences of chronic unregulated Akt activation in the heart (see the related articles beginning on pages 2108, 2119, and 2128). Here we discuss the implications of these exciting new studies. Citation Information: J Clin Invest. 2005;115(8):2067-2069. https://doi.org/10.1172/JCI26023. While the release of pollen into the air is essential for the reproduction of plants, the accidental yet inevitable uptake of pollen into human airways can cause symptoms of seasonal allergies and asthma. The symptomatic response to pollen is caused by granulocytes that produce inflammation, which is due in part to oxidative stress through the action of NADPH oxidases. The recruitment of these inflammatory granulocytes was previously thought to depend entirely on the activation of an adaptive immune response. In this issue of the JCI, Boldogh et al. demonstrate that pollens contain endogenous NADPH oxidase activity, which functions to generate local “danger signals” in nearby airway epithelium. These signals in turn trigger the early recruitment of granulocytes, even in the absence of the adaptive immune response. These findings suggest that inhibition of the pollen oxidase may provide a way to antagonize allergic inflammation at a very early step. Citation Information: J Clin Invest. 2005;115(8):2069-2072. https://doi.org/10.1172/JCI26045. The discovery of the antiinflammatory effect of insulin and the proinflammatory effect of glucose has not only provided novel insight into the mechanisms underlying several disease states but has also provided a rationale for the treatment of hyperglycemia in several acute clinical conditions. Van den Berghe et al. previously showed the benefits of intensive glycemic control with insulin in patients admitted to intensive care units. In this issue of the JCI, the same group of investigators now demonstrates that infusion of insulin to restore euglycemia in these patients results in a marked reduction in inflammatory indices such as adhesion molecules, hepatic iNOS, and plasma NO metabolites. The reduction in the mediators of inflammation may thus be responsible for the impressive improvement in clinical outcomes following insulin therapy, and the results suggest a new paradigm in which glucose and insulin are related not only through their metabolic actions but also through their opposite effects on inflammatory mechanisms. Citation Information: J Clin Invest. 2005;115(8):2072-2075. https://doi.org/10.1172/JCI26130. Macrophage scavenger receptors, such as CD36 and class A scavenger receptor (SR-A), have previously been thought to play a central role in foam cell formation and atherogenesis by mediating the uptake of oxidized LDL. In this issue of the JCI, Moore et al. report that Apoe–/– mice deficient in either CD36 or SR-A did not have less atherosclerosis at the level of the aortic valve than did wild-type Apoe–/– mice. In contrast, similar studies by previous investigators found that deletion of these receptors decreased atherogenesis. The reasons for the different results are not known, but these data suggest that the role of these receptors in atherogenesis remains unresolved. Citation Information: J Clin Invest. 2005;115(8):2075-2077. https://doi.org/10.1172/JCI26046. Bile acids are natural detergents that assist in the absorption and digestion of fats in the intestine. In liver, the synthesis of bile acids from cholesterol is regulated by multiple signaling cascades that repress transcription of the gene encoding cholesterol 7α-hydroxylase (CYP7A1), the rate-limiting enzyme in the classic bile acid synthesis pathway. In this issue of the JCI, Ito and coworkers demonstrate that mice lacking βKlotho, a membrane protein with 2 putative glycosidase domains, have increased Cyp7a1 mRNA levels and bile acid concentrations. βKlotho-KO mice also have small gallbladders and are resistant to cholesterol gallstone formation. These findings highlight the central role of βKlotho in bile acid homeostasis and raise the possibility that this protein could be a pharmacologic target for the treatment of gallstones. Citation Information: J Clin Invest. 2005;115(8):2077-2079. https://doi.org/10.1172/JCI26018. The distinction between peptides that bind to class II MHC products under laboratory conditions and those that do so physiologically is important for the prediction of antigens recognized by autoreactive T cells. In this issue of the JCI, Suri et al., using antigen-presenting cells, compared the peptides that bound to human HLA-DQ8 and those that bound to mouse I-Ag7, both class II MHC products that predispose their carriers to type 1 diabetes. The rules of engagement for the peptide ligands of the DQ8 and I-Ag7 molecules involve similarities in their anchor residues, which mediate stable interaction with class II MHC products. The peptides identified derive from overlapping sets of self proteins. Citation Information: J Clin Invest. 2005;115(8):2079-2082. https://doi.org/10.1172/JCI25642. Recently, mutations causing juvenile hemochromatosis have been identified in a novel gene, hemojuvelin (HJV), located on chromosome 1. Mouse models of this disease have now been developed by 2 groups, Huang et al. and Niederkofler et al., through targeted disruption of the Hjv gene (see the related articles beginning on pages 2180 and 2187). These mutant mice will allow further investigation into the role of HJV in the regulation of iron homeostasis, a role that to date remains elusive. Citation Information: J Clin Invest. 2005;115(8):2083-2098. https://doi.org/10.1172/JCI23559. G-CSF is a potent hematopoietic factor that enhances survival and drives differentiation of myeloid lineage cells, resulting in the generation of neutrophilic granulocytes. Here, we show that G-CSF passes the intact blood-brain barrier and reduces infarct volume in 2 different rat models of acute stroke. G-CSF displays strong antiapoptotic activity in mature neurons and activates multiple cell survival pathways. Both G-CSF and its receptor are widely expressed by neurons in the CNS, and their expression is induced by ischemia, which suggests an autocrine protective signaling mechanism. Surprisingly, the G-CSF receptor was also expressed by adult neural stem cells, and G-CSF induced neuronal differentiation in vitro. G-CSF markedly improved long-term behavioral outcome after cortical ischemia, while stimulating neural progenitor response in vivo, providing a link to functional recovery. Thus, G-CSF is an endogenous ligand in the CNS that has a dual activity beneficial both in counteracting acute neuronal degeneration and contributing to long-term plasticity after cerebral ischemia. We therefore propose G-CSF as a potential new drug for stroke and neurodegenerative diseases. Citation Information: J Clin Invest. 2005;115(8):2099-2107. https://doi.org/10.1172/JCI24650. Hypoxic vasodilation is a fundamental, highly conserved physiological response that requires oxygen and/or pH sensing coupled to vasodilation. While this process was first characterized more than 80 years ago, the precise identity and mechanism of the oxygen sensor and mediators of vasodilation remain uncertain. In support of a possible role for hemoglobin (Hb) as a sensor and effector of hypoxic vasodilation, here we show biochemical evidence that Hb exhibits enzymatic behavior as a nitrite reductase, with maximal NO generation rates occurring near the oxy-to-deoxy (R-to-T) allosteric structural transition of the protein. The observed rate of nitrite reduction by Hb deviates from second-order kinetics, and sigmoidal reaction progress is determined by a balance between 2 opposing chemistries of the heme in the R (oxygenated conformation) and T (deoxygenated conformation) allosteric quaternary structures of the Hb tetramer — the greater reductive potential of deoxyheme in the R state tetramer and the number of unligated deoxyheme sites necessary for nitrite binding, which are more plentiful in the T state tetramer. These opposing chemistries result in a maximal nitrite reduction rate when Hb is 40–60% saturated with oxygen (near the Hb P50), an apparent ideal set point for hypoxia-responsive NO generation. These data suggest that the oxygen sensor for hypoxic vasodilation is determined by Hb oxygen saturation and quaternary structure and that the nitrite reductase activity of Hb generates NO gas under allosteric and pH control. Citation Information: J Clin Invest. 2005;115(8):2119-2127. https://doi.org/10.1172/JCI24726. Akt, or protein kinase B, is a multifunctional serine-threonine protein kinase implicated in a diverse range of cellular functions including cell metabolism, survival, migration, and gene expression. However, the in vivo roles and effectors of individual Akt isoforms in signaling are not explicitly clear. Here we show that the genetic loss of Akt1, but not Akt2, in mice results in defective ischemia and VEGF-induced angiogenesis as well as severe peripheral vascular disease. Akt1 knockout (Akt1–/–) mice also have reduced endothelial progenitor cell (EPC) mobilization in response to ischemia, and reintroduction of WT EPCs, but not EPCs isolated from Akt1–/– mice, into WT mice improves limb blood flow after ischemia. Mechanistically, the loss of Akt1 reduces the basal phosphorylation of several Akt substrates, the migration of fibroblasts and ECs, and NO release. Reconstitution of Akt1–/– ECs with Akt1 rescues the defects in substrate phosphorylation, cell migration, and NO release. Thus, the Akt1 isoform exerts an essential role in blood flow control, cellular migration, and NO synthesis during postnatal angiogenesis. Citation Information: J Clin Invest. 2005;115(8):2128-2138. https://doi.org/10.1172/JCI23073. Acute activation of the serine-threonine kinase Akt is cardioprotective and reduces both infarction and dysfunction after ischemia/reperfusion injury (IRI). However, less is known about the chronic effects of Akt activation in the heart, and, paradoxically, Akt is activated in samples from patients with chronic heart failure. We generated Tg mice with cardiac-specific expression of either activated (myristoylated [myr]) or dominant-negative (dn) Akt and assessed their response to IRI in an ex vivo model. While dn-Akt hearts demonstrated a moderate reduction in functional recovery after IRI, no function was restored in any of the myr-Akt–Tg hearts. Moreover, infarcts were dramatically larger in myr-Akt–Tg hearts. Biochemical analyses demonstrated that chronic Akt activation induces feedback inhibition of PI3K activity through both proteasome-dependent degradation of insulin receptor substrate–1 (IRS-1) and inhibition of transcription of IRS-1 as well as that of IRS-2. To test the functional significance of these signaling changes, we performed in vivo cardiac gene transfer with constitutively active PI3K in myr-Akt–Tg mice. Restoration of PI3K rescued function and reduced injury after IRI. These data demonstrate that PI3K-dependent but Akt-independent effectors are required for full cardioprotection and suggest a mechanism by which chronic Akt activation can become maladaptive. Citation Information: J Clin Invest. 2005;115(8):2159-2168. https://doi.org/10.1172/JCI24225. The molecular characterization of leukemia has demonstrated that genetic alterations in the leukemic clone frequently fall into 2 classes, those affecting transcription factors (e.g., AML1-ETO) and mutations affecting genes involved in signal transduction (e.g., activating mutations of FLT3 and KIT). This finding has favored a model of leukemogenesis in which the collaboration of these 2 classes of genetic alterations is necessary for the malignant transformation of hematopoietic progenitor cells. The model is supported by experimental data indicating that AML1-ETO and FLT3 length mutation (FLT3-LM), 2 of the most frequent genetic alterations in AML, are both insufficient on their own to cause leukemia in animal models. Here we report that AML1-ETO collaborates with FLT3-LM in inducing acute leukemia in a murine BM transplantation model. Moreover, in a series of 135 patients with AML1-ETO–positive AML, the most frequently identified class of additional mutations affected genes involved in signal transduction pathways including FLT3-LM or mutations of KIT and NRAS. These data support the concept of oncogenic cooperation between AML1-ETO and a class of activating mutations, recurrently found in patients with t(8;21), and provide a rationale for therapies targeting signal transduction pathways in AML1-ETO–positive leukemias. Citation Information: J Clin Invest. 2005;115(8):2169-2179. https://doi.org/10.1172/JCI24422. Pollen exposure induces allergic airway inflammation in sensitized subjects. The role of antigenic pollen proteins in the induction of allergic airway inflammation is well characterized, but the contribution of other constituents in pollen grains to this process is unknown. Here we show that pollen grains and their extracts contain intrinsic NADPH oxidases. The pollen NADPH oxidases rapidly increased the levels of ROS in lung epithelium as well as the amount of oxidized glutathione (GSSG) and 4-hydroxynonenal (4-HNE) in airway-lining fluid. These oxidases, as well as products of oxidative stress (such as GSSG and 4-HNE) generated by these enzymes, induced neutrophil recruitment to the airways independent of the adaptive immune response. Removal of pollen NADPH oxidase activity from the challenge material reduced antigen-induced allergic airway inflammation, the number of mucin-containing cells in airway epithelium, and antigen-specific IgE levels in sensitized mice. Furthermore, challenge with Amb a 1, the major antigen in ragweed pollen extract that does not possess NADPH oxidase activity, induced low-grade allergic airway inflammation. Addition of GSSG or 4-HNE to Amb a 1 challenge material boosted allergic airway inflammation. We propose that oxidative stress generated by pollen NADPH oxidases (signal 1) augments allergic airway inflammation induced by pollen antigen (signal 2). Citation Information: J Clin Invest. 2005;115(8):2180-2186. https://doi.org/10.1172/JCI25683. Iron homeostasis plays a critical role in many physiological processes, notably synthesis of heme proteins. Dietary iron sensing and inflammation converge in the control of iron absorption and retention by regulating the expression of hepcidin, a regulator of the iron exporter ferroportin. Human mutations in the glycosylphosphatidylinositol-anchored protein hemojuvelin (HJV; also known as RGMc and HFE2) cause juvenile hemochromatosis, a severe iron overload disease, but the way in which HJV intersects with the iron regulatory network has been unclear. Here we show that, within the liver, mouse Hjv is selectively expressed by periportal hepatocytes and also that Hjv-mutant mice exhibit iron overload as well as a dramatic decrease in hepcidin expression. Our findings define a key role for Hjv in dietary iron sensing and also reveal that cytokine-induced inflammation regulates hepcidin expression through an Hjv-independent pathway. Citation Information: J Clin Invest. 2005;115(8):2187-2191. https://doi.org/10.1172/JCI25049. Hereditary hemochromatosis is an iron-overload disorder resulting from mutations in proteins presumed to be involved in the maintenance of iron homeostasis. Mutations in hemojuvelin (HJV) cause severe, early-onset juvenile hemochromatosis. The normal function of HJV is unknown. Juvenile hemochromatosis patients have decreased urinary levels of hepcidin, a peptide hormone that binds to the cellular iron exporter ferroportin, causing its internalization and degradation. We have disrupted the murine Hjv gene and shown that Hjv–/– mice have markedly increased iron deposition in liver, pancreas, and heart but decreased iron levels in tissue macrophages. Hepcidin mRNA expression was decreased in Hjv–/– mice. Accordingly, ferroportin expression detected by immunohistochemistry was markedly increased in both intestinal epithelial cells and macrophages. We propose that excess, unregulated ferroportin activity in these cell types leads to the increased intestinal iron absorption and plasma iron levels characteristic of the juvenile hemochromatosis phenotype. Citation Information: J Clin Invest. 2005;115(8):2192-2201. https://doi.org/10.1172/JCI24061. Macrophage internalization of modified lipoproteins is thought to play a critical role in the initiation of atherogenesis. Two scavenger receptors, scavenger receptor A (SR-A) and CD36, have been centrally implicated in this lipid uptake process. Previous studies showed that these receptors mediated the majority of cholesterol ester accumulation in macrophages exposed to oxidized LDL and that mice with deletions of either receptor exhibited marked reductions in atherosclerosis. This work has contributed to an atherosclerosis paradigm: scavenger receptor–mediated oxidized lipoprotein uptake is required for foam cell formation and atherogenesis. In this study, Apoe–/– mice lacking SR-A or CD36, backcrossed into the C57BL/6 strain for 7 generations, were fed an atherogenic diet for 8 weeks. Hyperlipidemic Cd36–/–Apoe–/– and Msr1–/–Apoe–/– mice showed significant reductions in peritoneal macrophage lipid accumulation in vivo; however, in contrast with previous reports, this was associated with increased aortic sinus lesion areas. Characterization of aortic sinus lesions by electron microscopy and immunohistochemistry showed abundant macrophage foam cells, indicating that lipid uptake by intimal macrophages occurs in the absence of CD36 or SR-A. These data show that alternative lipid uptake mechanisms may contribute to macrophage cholesterol ester accumulation in vivo and suggest that the roles of SR-A and CD36 as proatherosclerotic mediators of modified LDL uptake in vivo need to be reassessed. Citation Information: J Clin Invest. 2005;115(8):2202-2208. https://doi.org/10.1172/JCI23076. We have generated a line of mutant mouse that lacks βKlotho, a protein that structurally resembles Klotho. The synthesis and excretion of bile acids were found to be dramatically elevated in these mutants, and the expression of 2 key bile acid synthase genes, cholesterol 7α-hydroxylase (Cyp7a1) and sterol 12α-hydroxylase (Cyp8b1), was strongly upregulated. Nuclear receptor pathways and the enterohepatic circulation, which regulates bile acid synthesis, seemed to be largely intact; however, bile acid–dependent induction of the small heterodimer partner (SHP) NR0B2, a common negative regulator of Cyp7a1 and Cyp8b1, was significantly attenuated. The expression of Cyp7a1 and Cyp8b1 is known to be repressed by dietary bile acids via both SHP-dependent and -independent regulations. Interestingly, the suppression of Cyp7a1 expression by dietary bile acids was impaired, whereas that of Cyp8b1 expression was not substantially altered in βklotho–/– mice. Therefore, βKlotho may stand as a novel contributor to Cyp7a1-selective regulation. Additionally, βKlotho-knockout mice exhibit resistance to gallstone formation, which suggests the potential future clinical relevance of the βKlotho system. Citation Information: J Clin Invest. 2005;115(8):2209-2213. https://doi.org/10.1172/JCI23741. Expression of voltage-gated K+ channel, shaker-related subfamily, member 5 (KCNA5) underlies the human atrial ultra-rapid delayed rectifier K+ current (IKur). The KCNA5 polymorphism resulting in P532L in the C terminus generates IKur that is indistinguishable from wild type at baseline but strikingly resistant to drug block. In the present study, truncating the C terminus of KCNA5 generated a channel with wild-type drug sensitivity, which indicated that P532 is not a drug-binding site. Secondary structure prediction algorithms identified a probable α-helix in P532L that is absent in wild-type channels. We therefore assessed drug sensitivity of IKur generated in vitro in CHO and HEK cells by channels predicted to exhibit or lack this C-terminal α-helix. All constructs displayed near-identical IKur in the absence of drug challenge. However, those predicted to lack the C-terminal α-helix generated quinidine-sensitive currents (43–51% block by 10 μM quinidine), while the currents generated by those constructs predicted to generate a C-terminal α-helix were inhibited less than 12%. Circular dichroism spectroscopy revealed an α-helical signature with peptides derived from drug-resistant channels and no organized structure in those associated with wild-type drug sensitivity. In conclusion, we found that this secondary structure in the KCNA5 C terminus, absent in wild-type channels but generated by a naturally occurring DNA polymorphism, does not alter baseline currents but renders the channel drug resistant. Our data support a model in which this structure impairs access of the drug to a pore-binding site. Citation Information: J Clin Invest. 2005;115(8):2214-2222. https://doi.org/10.1172/JCI24327. Plasma LDL levels and atherosclerosis both increase on a saturated fat–rich (SAT) diet. LDL cholesterol delivery to tissue may occur via uptake of the LDL particles or via selective uptake (SU), wherein cholesteryl ester (CE) enters cells without concomitant whole-particle uptake. It is not known how dietary fats might directly affect arterial LDL-CE uptake and whether SU is involved. Thus, mice that are relatively atherosclerosis resistant (C57BL/6) or susceptible to atherosclerosis (apoE–/–) were fed a chow or SAT diet and injected with double radiolabeled or fluorescent-labeled human LDL to independently trace LDL-CE core and whole-particle uptake, respectively. Our results show that a SAT diet increased contributions of SU to total arterial LDL-CE delivery in C57BL/6 and apoE–/– mice. The SAT diet increased plasma fatty acid and cholesterol levels; cholesterol, but not fatty acid, levels correlated with SU, as did the degree of atherosclerosis. Increased SU did not correlate with arterial scavenger receptor class B type I levels but paralleled increased lipoprotein lipase (LPL) levels and LPL distribution in the arterial wall. These studies suggest that arterial LDL-CE delivery via SU can be an important mechanism in vivo and that dietary influences on arterial LPL levels and atherogenesis modulate arterial LDL-CE delivery, cholesterol deposition, and SU. Citation Information: J Clin Invest. 2005;115(8):2223-2233. https://doi.org/10.1172/JCI23755. Biglycan, a small leucine-rich proteoglycan, is a ubiquitous ECM component; however, its biological role has not been elucidated in detail. Here we show that biglycan acts in macrophages as an endogenous ligand of TLR4 and TLR2, which mediate innate immunity, leading to rapid activation of p38, ERK, and NF-κB and thereby stimulating the expression of TNF-α and macrophage inflammatory protein–2 (MIP-2). In agreement, the stimulatory effects of biglycan are significantly reduced in TLR4-mutant (TLR4-M), TLR2–/–, and myeloid differentiation factor 88–/– (MyD88–/–) macrophages and completely abolished in TLR2–/–/TLR4-M macrophages. Biglycan-null mice have a considerable survival benefit in LPS- or zymosan-induced sepsis due to lower levels of circulating TNF-α and reduced infiltration of mononuclear cells in the lung, which cause less end-organ damage. Importantly, when stimulated by LPS-induced proinflammatory factors, macrophages themselves are able to synthesize biglycan. Thus, biglycan, upon release from the ECM or from macrophages, can boost inflammation by signaling through TLR4 and TLR2, thereby enhancing the synthesis of TNF-α and MIP-2. Our results provide evidence for what is, to our knowledge, a novel role of the matrix component biglycan as a signaling molecule and a crucial proinflammatory factor. These findings are potentially relevant for the development of new strategies in the treatment of sepsis. Citation Information: J Clin Invest. 2005;115(8):2234-2243. https://doi.org/10.1172/JCI19102. To explore the requirement for M cells and the Peyer’s patch (PP) in induction of oral tolerance and address the potential in vivo role of intestinal epithelial cells as nonprofessional APCs, we have attempted to induce tolerance in mice with ligated small bowel loops without M cells and Peyer’s patches. A 2-centimeter section of vascularized small bowel was spliced away from the gut without disruption of the mesenteric attachments. We introduced OVA directly into the lumen of the loop prior to footpad immunization. By excising segments of bowel that contain PPs in some mice and segments without patches in others, we could study the necessity of the M cell and the underlying patch versus epithelial cells in induction of mucosal tolerance. We show that OVA-specific T cell proliferation and serum antibody responses are reduced in mice that have previously been given OVA both in PP-containing loops and in loops without patches. Furthermore, both high- and low-dose tolerance could be induced in the absence of PPs. Low-dose tolerance is associated with bystander suppression and requires IL-10, which indicates active suppression and the induction of regulatory cells. These data suggest that there is a critical role for components of the mucosal immune system other than PPs in antigen sampling and induction of oral tolerance. Citation Information: J Clin Invest. 2005;115(8):2244-2256. https://doi.org/10.1172/JCI24130. In addition to its role in energy storage, adipose tissue also accumulates cholesterol. Concentrations of cholesterol and triglycerides are strongly correlated in the adipocyte, but little is known about mechanisms regulating cholesterol metabolism in fat cells. Here we report that antidiabetic thiazolidinediones (TZDs) and other ligands for the nuclear receptor PPARγ dramatically upregulate oxidized LDL receptor 1 (OLR1) in adipocytes by facilitating the exchange of coactivators for corepressors on the OLR1 gene in cultured mouse adipocytes. TZDs markedly stimulate the uptake of oxidized LDL (oxLDL) into adipocytes, and this requires OLR1. Increased OLR1 expression, resulting either from TZD treatment or adenoviral gene delivery, significantly augments adipocyte cholesterol content and enhances fatty acid uptake. OLR1 expression in white adipose tissue is increased in obesity and is further induced by PPARγ ligand treatment in vivo. Serum oxLDL levels are decreased in both lean and obese diabetic animals treated with TZDs. These data identify OLR1 as a novel PPARγ target gene in adipocytes. While the physiological role of adipose tissue in cholesterol and oxLDL metabolism remains to be established, the induction of OLR1 is a potential means by which PPARγ ligands regulate lipid metabolism and insulin sensitivity in adipocytes. Citation Information: J Clin Invest. 2005;115(8):2257-2267. https://doi.org/10.1172/JCI24646. Autoantibody production during infections is considered to result from nonspecific activation of low-affinity autoreactive B cells. Whether this can lead to autoimmune disease remains uncertain. We show that chronic infection by Borrelia burgdorferi of Tg animals expressing human rheumatoid factor (RF) B cells (of low or intermediate affinities) in the absence or in the constitutive presence of the autoantigen (represented here by chimeric IgG with human constant region) breaks their state of immunological ignorance, leading to the production of RFs. Surprisingly, this production was more pronounced in intermediate-affinity RF Tg mice coexpressing the autoantigen. This overproduction was mediated by immune complexes and involved synergistic signaling between the B cell receptor and Toll-like receptors and T cell help. These findings indicate that chronic infection can activate autoreactive B cells with significant affinity and creates conditions that can drive them to differentiate into memory cells. Such cells may have some physiological yet undetermined role, but in autoimmune-prone individuals, this scenario may initiate autoimmunity. Citation Information: J Clin Invest. 2005;115(8):2268-2276. https://doi.org/10.1172/JCI25350. In this study, a large number of naturally processed peptides was isolated and identified from the human diabetes-susceptible class II MHC molecules HLA-DQ8 (DQA1*0301,DQB1*0302) and from murine I-Ag7 species, both of which are expressed in genetically identical APC lines. The peptides presented during the processing of autologous proteins were highly selective in showing sequence specificity, mainly consisting of 1 or more acidic residues at their C terminus. Testing for binding to the MHC molecules revealed that the position 9 (P9) acidic residues of the peptides contributed decisively to binding. For HLA-DQ8, the P1 residue, which was also an acidic amino acid, influenced binding positively. Both HLA-DQ8 and I-Ag7 selected for common peptides that bound in the same register. There was no evidence for selection of peptides having nonspecific or promiscuous binding. Thus, diabetogenic class II MHC molecules are highly selective in terms of the peptides presented by their APCs, and this is governed by the features of their P9 anchor pocket. These results are in striking contrast to those from studies examining synthetic peptide or phage display libraries, in which many peptides were shown to bind. Citation Information: J Clin Invest. 2005;115(8):2277-2286. https://doi.org/10.1172/JCI25385. The vascular endothelium controls vasomotor tone and microvascular flow and regulates trafficking of nutrients and biologically active molecules. When endothelial activation is excessive, compromised microcirculation and subsequent cellular hypoxia contribute to the risk of organ failure. We hypothesized that strict blood glucose control with insulin during critical illness protects the endothelium, mediating prevention of organ failure and death. In this preplanned subanalysis of a large, randomized controlled study, intensive insulin therapy lowered circulating levels of ICAM-1 and tended to reduce E-selectin levels in patients with prolonged critical illness, which reflects reduced endothelial activation. This effect was not brought about by altered levels of endothelial stimuli, such as cytokines or VEGF, or by upregulation of eNOS. In contrast, prevention of hyperglycemia by intensive insulin therapy suppressed iNOS gene expression in postmortem liver and skeletal muscle, possibly in part via reduced NF-κB activation, and lowered the elevated circulating NO levels in both survivors and nonsurvivors. These effects on the endothelium statistically explained a significant part of the improved patient outcome with intensive insulin therapy. In conclusion, maintaining normoglycemia with intensive insulin therapy during critical illness protects the endothelium, likely in part via inhibition of excessive iNOS-induced NO release, and thereby contributes to prevention of organ failure and death. Citation Information: J Clin Invest. 2005;115(8):2287-2295. https://doi.org/10.1172/JCI23966. SCID patients have been successfully treated by administration of ex vivo gene-corrected stem cells. However, despite its proven efficacy, such treatment carries specific risks and difficulties. We hypothesized that some of these drawbacks may be overcome by in situ gene correction of T lymphoid progenitors in the thymus. Indeed, in vivo intrathymic transfer of a gene that provides a selective advantage for transduced prothymocytes should result in the generation of functional T lymphocyte progeny, allowing long-term immune reconstitution. We assessed the feasibility of this approach in a murine model of ZAP-70–deficient SCID. A T cell–specific ZAP-70–expressing lentiviral vector was injected into thymi of adult ZAP-70–/– mice without prior conditioning. This resulted in the long-term differentiation of mature TCR-αβ+ thymocytes, indicating that the vector had integrated into progenitor cells. Moreover, peripheral ZAP-70–expressing T cells demonstrated a partially diversified receptor repertoire and were responsive to alloantigens in vitro and in vivo. Improved treatment efficacy was achieved in infant ZAP-70–/– mice, in which the thymus is proportionately larger and a higher percentage of prothymocytes are in cycle. Thus, intrathymic injection of a lentiviral vector could represent a simplified and potentially safer alternative to ex vivo gene-modified hematopoietic stem cell transplantation for gene therapy of T cell immunodeficiencies. Citation Information: J Clin Invest. 2005;115(8):2296-2296. https://doi.org/10.1172/JCI21716C1. Citation Information: J Clin Invest. 2005;115(8):2296-2296. https://doi.org/10.1172/JCI22973C1. Citation Information: J Clin Invest. 2005;115(8):2297-2297. https://doi.org/10.1172/JCI22849E1. Citation Information: J Clin Invest. 2005;115(8):2297-2297. https://doi.org/10.1172/JCI23962E1. Citation Information: J Clin Invest. 2005;115(8):2298-2298. https://doi.org/10.1172/JCI25455E1.